Who doesn’t love a super quick meal that tastes like it took hours to make? We sure do! 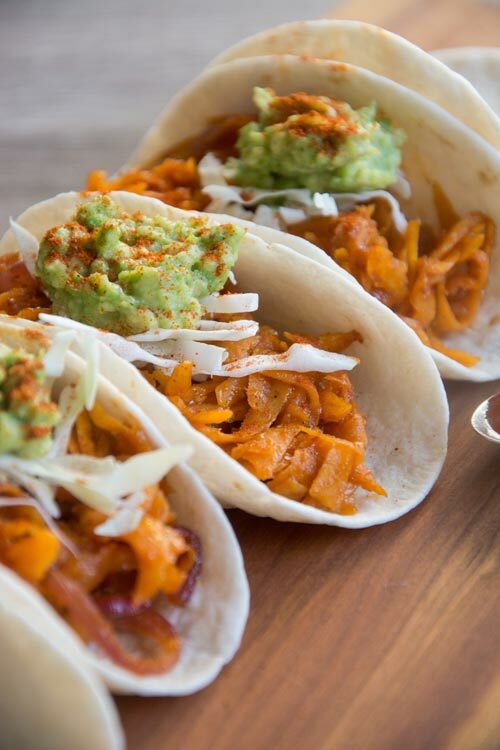 Our Shredded Sweet Potato Tacos only take 25 minutes to make, but we promise everyone will think they took longer. These tacos are kind of a spin on “pulled pork tacos”, replacing the pork with shredded sweet potato. Adding in some onions, garlic, spices and slathering it all up in BBQ sauce you have yourself a winning dish. 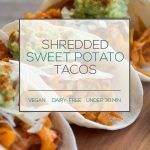 Shredded Sweet Potato Tacos are great for dinner, but also great as appetizers. if you buy the mini size tortillas and serve them as appetizers they’re a great potluck finger food. We’ve tested them and they are a crowd pleaser, they won’t last more than 10 minutes! We hope you enjoy these tacos as much as we do, because they really are turning into a staple weeknight meal around here. Bon appetit friends! 1 cup BBQ Sauce Use your favourite! Using a cheese grater, grate the peeled sweet potatoes. Use a standing cheese grater that would be used to shred cheddar cheese. It should look shredded when it’s all done. Next, add 1 tablespoon of olive oil to a large skillet over medium heat. When the oil is hot add in the thinly sliced onion and saute for 4-5 minutes until the onion is soft and tender. Add in the crushed garlic and saute for 1 additional minute, until fragrant. Add in the shredded sweet potato and saute for 5 minutes, stirring frequently to ensure it doesn't stick to the pan. Add the BBQ sauce, onion powder, garlic powder, salt and paprika. Stir to incorporate everything well and cook for 10 additional minutes. The sweet potatoes are done when they are soft and tender and no longer crunchy. Serve on tortillas and top with coleslaw mix and mashed avocado.